« Homepage / Gourmet / "A New Era: Star chef revises concept"
When Anne Kearney gave up her popular Peristyle restaurant in New Orleans a few years ago, locals went into mourning. 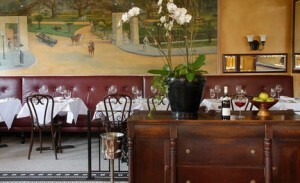 But the acclaimed chef Tom Wolfe took over in 2004 and regulars were reassured and started coming back. The first time I ate at this popular 16-year-old restaurant was under the original owner’s, Chef John Neal’s, tenure and it was a great place to go for a romantic date. The handsome restaurant located at 1041 Dumaine Street on the edge of the French Quarter became wildly popular when Kearney took over the helm and jazzed it up with exemplary French cuisine (she won a James Beard Award during her esteemed regime). The menu is described as “food with no boundaries.” The chef has integrated many different flavors and cultural influences to showcase the best of his talent. The famous bar, thankfully, has remained untouched but you will be able to get a few new drinks from bartenders who are known for their generously apportioned cocktails. 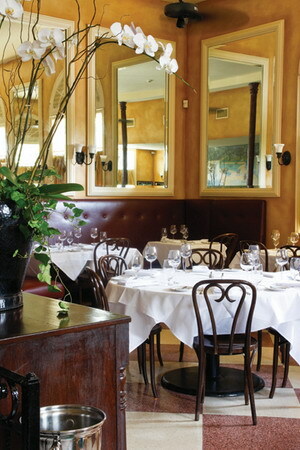 The burgundy leather banquettes and multilevel seating have remained, and the service has been kicked up a notch. A few Peristyle signatures can still be found, including Louisiana crabmeat and roasted beets, and Gulf fish amandine. But you won’t find French warhorses such as veal sweetbreads, duck confit, or escargots anymore. Instead, new appetizers at Wolfe’s include pan-seared house cured duck sausage topped with Hudson Valley foie gras and a sweet potato nest; poached P&J oyster stew; and braised Kobe beef short ribs. New entrées include “duck, duck, goose,” which is Steen’s cane syrup slow-roasted duck with seared foie gras topped with homemade duck sausage and a fresh tarragon demi-glace; tamarind glazed pork with crispy Poblano chili rings; filet of prime beef tenderloin; squab galantine; and a marvelous oyster po-boy on a French baguette enhanced with grilled lettuce, applewood smoked bacon, oven-dried tomatoes, and a blue cheese barbecue sauce. Also new at Wolfe’s are the small plate offerings for those who would prefer to graze. Check out the jerk chicken, smoked duck pastrami, buffalo shrimp (see recipe below), braise Kobe beef short ribs, and Wolfe’s luscious soup duo: tomato saffron bisque with Louisiana blue crab and olive chips; and Wolfe’s Parmesan martini with bacon lardoons, a mushroom salted rim, and demi croutons. 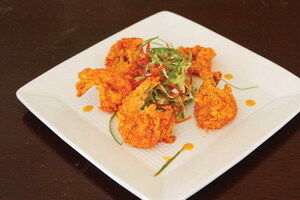 The new concept, new menu, and new style will serve the legendary restaurant well. 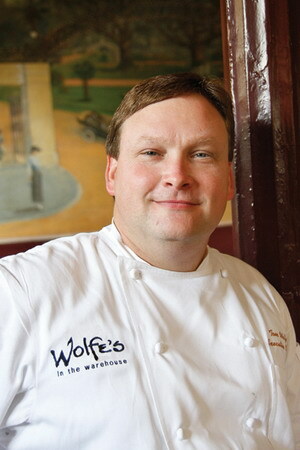 Wolfe’s is a welcome addition to the ever-expanding New Orleans restaurant scene. Here you can write a comment to the post "A New Era: Star chef revises concept"